Each entrant will also receive public transport to and from the event by showing their race bib. Each finisher will receive a quality commemorative medal. Marathon finishers will also receive a finishers T-shirt for their efforts. Run one of the world's most scenic bucket-list marathons taking in all of the Sydney iconic landmarks. Run across the Sydney Harbour Bridge traffic free and finish at the Sydney Opera House! Start at Bradfield Park, Milsons Point travel over the main deck of the Sydney Harbour Bridge, finishing at the Sydney Opera House. Please attach your race bib clearly on the front of your shirt, your timing chip is attached on the back of the race bib. Enjoy the views from the Sydney Opera House as you wait for your runners to come back to the finish line! As a Blackmores Volunteer you will be working with event staff, charities, community and sporting groups, students and other individual volunteers. There are numerous locations around the 42km course for you to volunteer; along with a wide range of roles available on event day (Sunday 15 September) and at the ASICS Event Expo from Thursday 12 September to Saturday 14 September. Please see the event website to sign up! WHAT IS THE DATE OF THE 2018 BLACKMORES SYDNEY RUNNING FESTIVAL? The ASICS Event Expo will be held in Lower Town Hall, corner of George and Druitt Streets, Sydney between the 12 – 14 September 2019. All participants are required to attend the ASICS Event Expo to collect their race bib. WHAT DO I NEED TO BRING FOR RACE BIB COLLECTION? To pick up your race bib you must bring a copy of your confirmation email sent to your nominated email address shortly after registering. Alternatively, you will also receive a SMS reminder during Event week if you had nominated a mobile number on your online registration form. Race bibs are organised via bib number, therefore volunteers will need this to locate your race bib instead of your full name. If you are unable to pick up your race bib during the Event Registration week you can nominate someone to collect it on your behalf. The nominated person will need to bring a copy of the confirmation email or SMS. NO race bibs will be mailed out. For those who are unable to collect from the ASICS Event Expo, race day collection will be available from 5:00am from Bradfield Park. Please be aware that there may be lengthy queues so allow at least an hour and half prior to your race in order to collect your bib before your race start time. There will be limited baggage transport at the Race Start. If you choose to drop you bag on race morning please note that this will not be available for collection until 12pm. In order to collect your bag immediately after the conclusion of your race and not have to wait until 12pm please utilise the baggage facility provided at the ASICS Event Expo to drop off in advance, any race day bags that you will require post- race. This early drop off facility will enable us to have your bags ready and waiting for you in the baggage area as soon as you have finished your race. Please do not place in your bag valuables such as wallets, keys, phones etc. Belongings must be collected before 2:30pm on Sunday race day or they will be treated as lost property. The organisers take no responsibility for the contents of any bag, for theft or loss of property. For slower runners, joggers or walkers it is important to be in the correct starting group. There are three groups in each race all seeded according to expected finish time. Your time will not be affected in any way as the timing chip will only record your time from when you cross the start mats to the finish line mats. This will allow you to enjoy the event at your own pace and provide you with the best possible end result. No prams, scooters, or wheelchairs (except racing chairs in the Marathon) are to be taken on to the Marathon course. All prams and wheelchairs must only be in the final start group of the Blackmores Bridge Run (C Group). WHERE ARE THE REFRESHMENT STATIONS? IsoWhey and GU gels are available at selected drink stations along the Marathon course. Water stations will be available along the Bridge Run course including the finish line. ARE THERE GOING TO BE PACE MAKERS? To assist you in achieving your personal best, Pace Setters will be provided by Sydney Striders. Each Pace Setter will be holding a coloured flag and will wear an identifiable “Sydney Striders” green and white singlet. The pace time will be marked on the flag and back of shirt. Marathon: Entrants must be a minimum of 18 years of age to enter the Marathon. Bridge Run: There are no age restrictions for the 10km Bridge Run. WHAT ARE THE FINISHER REWARDS? Marathon: An official finisher T-shirt and quality commemorative medal featuring Sydney’s spectacular icons, the Sydney Harbour Bridge and the Sydney Opera House. 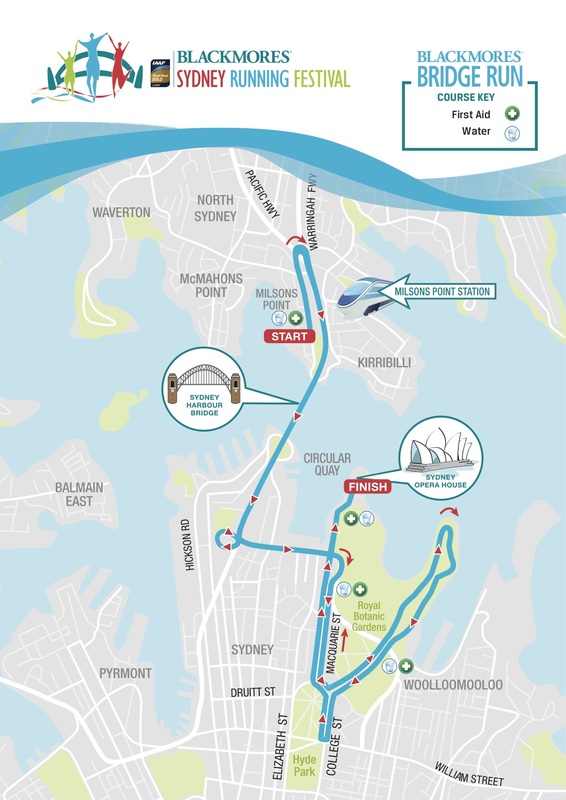 Bridge Run: Finishers will receive a commemorative medal featuring Sydney’s spectacular icons, the Sydney Harbour Bridge and the Sydney Opera House. WHEN IS THE EVENT EXPO AND RACE BIB COLLECTION? The ASICS Event Expo will be held at Lower Town Hall, George Street, Sydney from 12 – 14 September 2019. All participants are required to attend the ASICS Event Expo to collect their race bib. The Real Insurance Sydney Harbour 10k and 5k is an active way to get out and experience Sydney's most iconic sites. 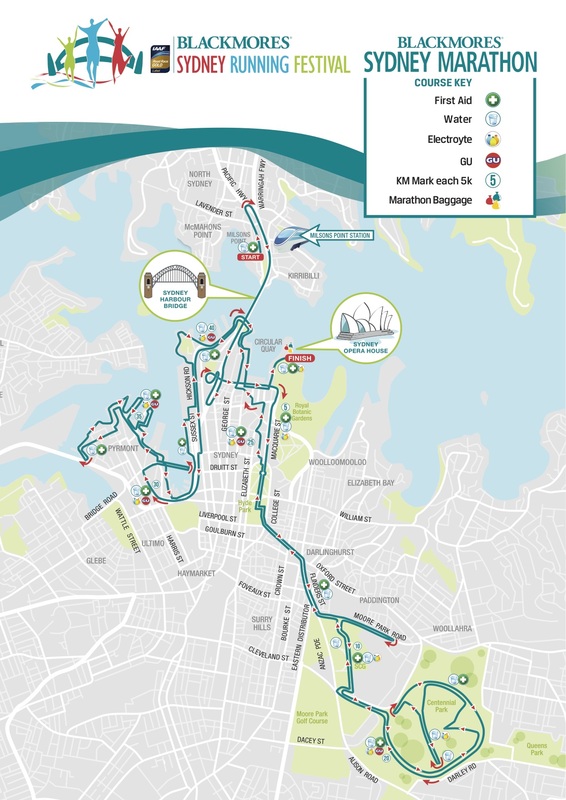 The events both start in The Rocks and continue to Cockle Bay, Darling Harbour, Barangaroo Reserve and finish at The Rocks.